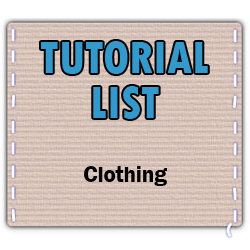 Here are links to an almost completely thorough list of the tutorials that are available on Craftster's Clothing boards. Some tutorials were excluded for lack of pictures and no tutorials listed on other sites were included. thanks for the tutorial list - finally getting back into sewing and loving everyone's ideas. They will most definitely be updated! I'm trying to keep track behind the scenes but I'm also still trying to finish up tutorial lists for other boards and even full categories, so I'll either find some time in between new lists or wait and do a massive site wide update of lists as soon as I'm done with all of them. Trust me, no one wishes I was faster more than I do!